As I push my bike down the gravel driveway, the sun is absent; however, a faint glow on the western horizon indicates its arrival is imminent. Hopping onto my bike, I begin peddling down the dark deserted road with the summer cicadas cheering me on. This warm and humid early July morning benefits from a strong southwest breeze that makes the temperature feel cooler that it is. I guess the heat index was invalidated by the wind chill. I’m riding on Bogue Banks, home to the towns of Emerald Isle, Indian Beach, Salter Path, Pine Knoll Shores and Atlantic Beach. This beautiful barrier island along the central coast of North Carolina has become a popular cycling destination for locals and tourists. Thirty years ago, I wouldn’t have seen another rider putting in the miles this early in the morning. Yet, within a few miles I have already seen a number of the bright pulsating halogen lights of riders zipping down Highway 58. The marsh islands as seen from the Emerald Isle bridge. With an orange sun reaching into the sky I decide to ride to the top of the Cameron Langston high rise bridge for one of the best views in Carteret County. The low angle of the sun draped everything is a soft warm golden glow. The green marsh islands look like pieces of a puzzle drifting on the emerald waters of the sound. Among the islands, a number of great egrets are poised to begin the morning in search of a meal. 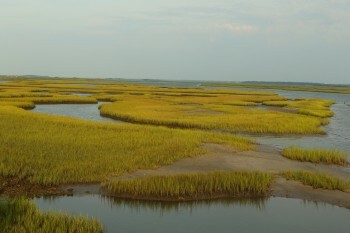 The channels that cut through the marsh islands creates a maze for the fishermen checking their crab pots. Turning around at the top of the bridge I then speed down the incline and head east towards Fort Macon. The west wind feels like a hand pushing on my back allowing me to race along like a pro cyclist. Along the way, where ever possible, I would drop down to the beach roads that parallel the main highway. Here, I could see the dunes that were sprouting a feathery stubble of new sea oats swaying in the wind. I could see the ocean through gaps in the dunes and even smell and taste the salty air. As if under a trance, people were already heading to the beach under a heavy burden of coolers, chairs and fat beach bags. Others seemed in a state of bliss as they returned from a sunrise beach walk with coffee cup in hand. Thanks to the wind, I arrived at Fort Macon State Park in what seemed like no time. Now it was time to pay the piper and head into the gusting winds for the 25 mile ride back to the western point the banks. After a while, I got into a rhythm and it didn’t seem too bad. All along the way back, in each town, people were headed to the beach or out into the sounds in their boats. The public beach access areas, boat ramps and rental houses were full. The allure of the coast, its esthetic beauty, swimming, sunbathing, shelling, fishing, boating and just plain old relaxing are a tonic to sooth the soul. However, it’s easy to take these magical natural resources for granted and forget that our enjoyment of these coastal habitats depends on clean water. The North Carolina Coastal Federation has been the leader for over thirty years in addressing issues of water quality, wetland restoration and eliminating and reducing pollutants from reaching our waterways. Through the creation of hundreds of acres of marsh and oyster reef habitats, plus numerous education and outreach programs, the federation and its army of volunteers help to restore and protect the coast, making it a healthier place to live, play and work. But they can’t do it alone. You can help and have fun by simply riding your bike on September 26, 2015. Cycling for the Coast is a federation sponsored event to help support their restoration and education programming. This is a cycling event for all levels of cycling experience with three different distances. Yes, there will be riders in their racing jerseys that will smoke the course but don’t let that intimidate you. There will also be families out for a leisurely ride. Heck, just come and ride a mile or two if you want. Not in shape to ride, no problem, you can even sign up as a virtual rider to show your support. Spread the word and challenge your family, your friends and your coworkers to come out for the ride. Let’s make this a big event to help the federation protect our coast, your coast. PreviousPrevious post:Hyde County Restoration Project BeginsNextNext post:Federation contributes to Latest RAE Living Shorelines report.